At the head of the field and in the centre lane of the Malacca Strait, Telefónica (Iker Martínez/ESP) is in a closely fought battle with Groupama 4 (Franck Cammas/FRA) and Puma’s Mar Mostro (Ken Read/USA). It’s almost too close to call with barely a mile between the top trio as the fleet are at the midway point of Leg 3 of the Volvo Ocean Race. Overnight, the six boats racing through the Malacca Strait on Leg 3, Stage 2 of the Volvo Ocean Race to Sanya in China were split in their opinion of which way would pay as the wind allowed them to hoist downwind sails in a good breeze. Telefónica led the field in a gybe when the wind shifted right, while CAMPER (Chris Nicholson/AUS) and Ian Walker’s Abu Dhabi Ocean Racing who are engaged in similar combat, both opted to stand on and go close to the Malaysian shore. Team Sanya (Mike Sanderson/NZL) chose a third option and is keeping close to the coast of Sumatra. In the fast lane, Ken Read is intent on keeping in touch with the leaders, but not at the expense of sailing themselves out of ‘their’ racecourse. According to navigator Tom Addis, there are several gybes required to make their way east for the race exclusion zone and the timing is critical. With shifty winds and ominous clouds, it is important not to over stand and go too far, or go too early and become sucked into the incoming weather to the north. Ian Walker, who last time was in charge of Green Dragon, was earlier ruing his decision to head for Malaysian shore, as the leading trio carried a good breeze straight through, while his team was at a standstill with Camper. ‘The net loss to us could be as much as 50 miles and certainly leaves us praying for a ‘park-up’ somewhere further down the Strait,’ he said. At around 0700 UTC this morning, Walker had Camper in sight, just two miles ahead and for the first time, Abu Dhabi Ocean Racing were enjoying the physical company of another boat, rather than racing dots on a computer screen. The sailors are also enjoying the company of a bat who is hanging from the mainsail on a reef point, catching up on his sleep. ‘I guess he got blown off the land last night and couldn’t find his way back,’ Walker said. ‘I think he likes our black sails and Azzam’s Falcon. We will try to deliver him back towards the shore tonight,’ he said. 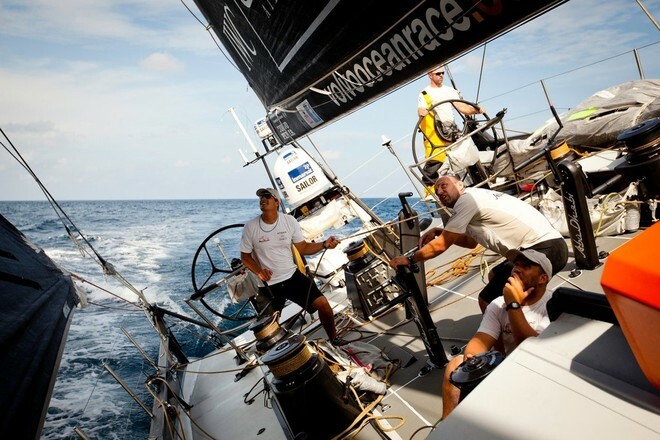 At 1000 UTC Camper And Azzam were trailing the leaders by 28 nm, however the breeze had filled in for the inshore boats and Walker reported sailing at a steady 15 knots towards the target. Team Sanya’s Sumatran coastal tour, 132 nm behind Telefónica, took them in to close contact with a massive car transporter ship, which was approaching on a collision course at around 18 knots. The team had right of way, but the ship did not show any sign of slowing or altering course. Navigator Aksel Magdahl made radio contact requesting the captain to slow down or pass across Sanya’s stern, as gybing away would entail sailing Sanya straight into a windless cloud. After some polite negotiation, the ship passed clear ahead after speeding up and Sanya avoided gybing and were able to stay in constant pressure.